It is my pleasure to extend to all my fellow citizens the warmest of Easter Greetings. Easter is the most sacred period in the life of the Christian Churches, and Christians around the world. This year the celebration of the victory of good over evil is very important in a troubled world. To me the Easter story is a quite simple, but it is certainly profound. The Easter story represents the victory and triumph of good over evil. On the first Good Friday Jesus Christ was cruelly and unjustly executed on the cross, and on the first Easter Day he triumphed over injustice and evil by his resurrection. As a Christian nation, this is a time for us to reflect on the Easter story, and ask how we can follow the example Christ set in our daily lives and the life of Papua New Guinea. I believe we can and we must do so by being tolerant of our critics, and understanding of those who do not agree with us. We also need to build on our strengths, on the things that unite us and that we agree on, to build stronger and happier communities and an even more united nation. One of our greatest strengths is our belief in the teachings of Christ that are followed in Christian families and communities right across our nation. I acknowledge the wonderful contribution to the life of our nation by Christian churches and communities, a contribution that enriches the quality of our national life, and offers great hope for our future. This Easter, I ask you to remember and pray for the millions of Christians in the Middle East and other places around the world who are the subject of persecution, cruelty and death at the hands of terrorists and people of evil intent. It is tragic that Christian minorities are being persecuted in the lands close to where Christ lived two thousand years ago. We must all hope for a just peace in the Middle East that ends persecution and protects religious freedom and liberty. Only this week we have seen terrible acts of violence in Europe. As a world we must strive for peace and the end to such despicable acts that are carried out by people under a false guise of their own religion. Jesus Christ preached the word of peace for the world, now is the time for the world to come together to find peace. Easter is also a holiday period, shared by Christians and non-Christians alike in Papua New Guinea and around the world. I hope you will all enjoy a safe Easter holiday, and have the opportunity to share Easter with your family and your friends in a spirit of good will. Please take care of each other and be safe over this Christmas weekend. 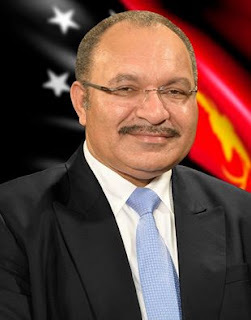 To all our Christian Churches and Christian communities right across Papua New Guinea I extend greetings as you celebrate the important Christian festival of Easter. A Happy Easter to all our fellow citizens, and our visitors who are joining with us as we celebrate the death and resurrection of Jesus Christ and the significance and inspiration it continues to have for Christian people in Papua New Guinea today.